For countries where most health workers have mobile phones, where SMS communication is cheap and where telephone network is reliable, SMS communication can be an effective way of collecting significant data. It has been found that one monthly report on the number of heat and cold alarms can provide sufficient information for a reasonable diagnosis of the equipment. An integrated pilot 30DTR and stock management project called Cold Chain Information System (CCIS) has been developed and implemented in Laos. 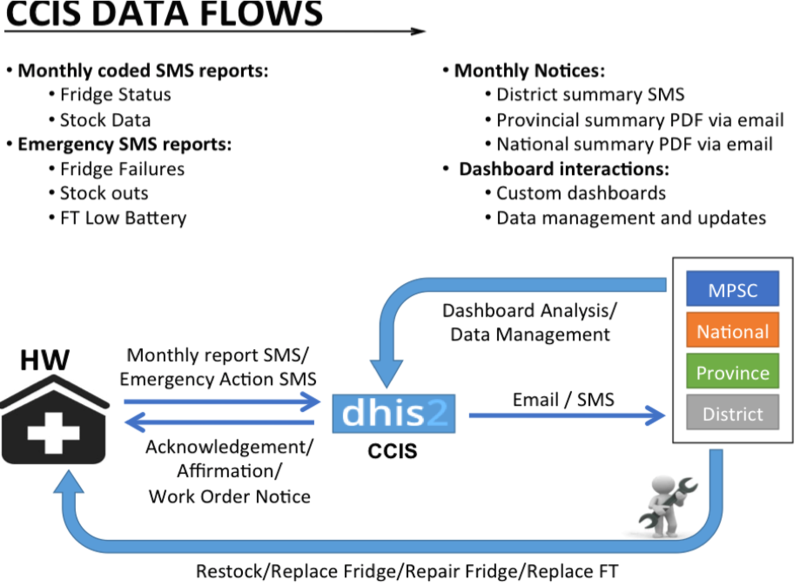 The system uses SMS coding for communication and is being linked with District Health Information System 2 (DHIS2) as illustrated in the 2 figures below. At the beginning of each month, the health worker sends high and low temperature alarm counts to the district supervisor. The system software sends a confirmation of receipt of data via SMS and follows up by SMS if the data has not been received. These SMS messages are written in a simple standardized code that makes them machine-readable. The code includes the clinic identifier, the refrigerator identifier (this is especially important if there are multiple refrigerators at the same location) and the number of heat/freeze alarms. The SMS also includes reporting on the available stock level, currently only for the pneumococcal conjugate vaccine (PCV) and the pentavalent vaccines. This system has been extended to include so-called ‘event codes’ SMS. As shown in the figure above, these codes are used in the SMS sent by health workers either to technicians or to EPI managers to report important issues calling for immediate attention and action. The SMS includes the ‘event code’ and the reference of the health facility or refrigerator for easy identification. The SMS includes the event code and references the health facility or refrigerator for easy identification. More information can be found on this model in the CCIS report and the Laos SMS coding documents in the related resources below. A number of platforms based on rapid SMS are currently being developed. The challenge is their integration with other health intervention systems (District Health Information System DHIS2, Logistics Management and Information System LMIS). For countries that already use DHIS2, further uses through customization with rapid SMS provide a standard approach across the ministry of health with the existing system already in place for necessary maintenance of infrastructure and adaptation to existing systems, presenting a cheaper, easier and quicker option. The compatibility and integration with existing systems used in the country is a crucial parameter in the choice of a solution.